You can create a private Data Source that a specific Data Command Query or Execution Plan uses or a shared Data Source which all can use. For this example we shall create a shared Data Source. 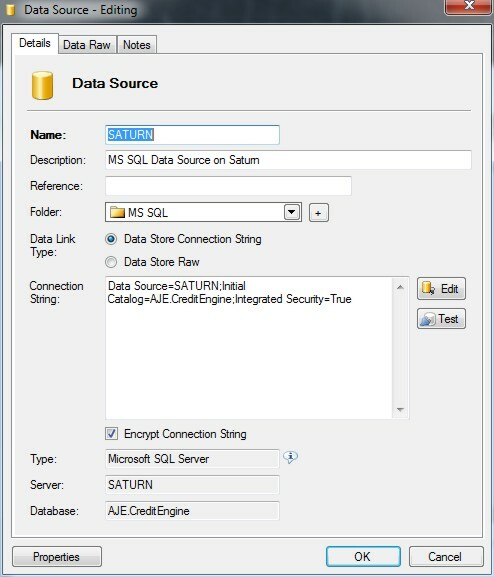 Select the Data Sources Tab from the Data Management Studio. Indigo DQM supports multiple Data Sources and Types including Microsoft SQL Server, Microsoft Access, ODBC, OLEDB, MySQL, Oracle, Postgre, Firebird, XML and CSV making it transparent to virtually all Data Sources. 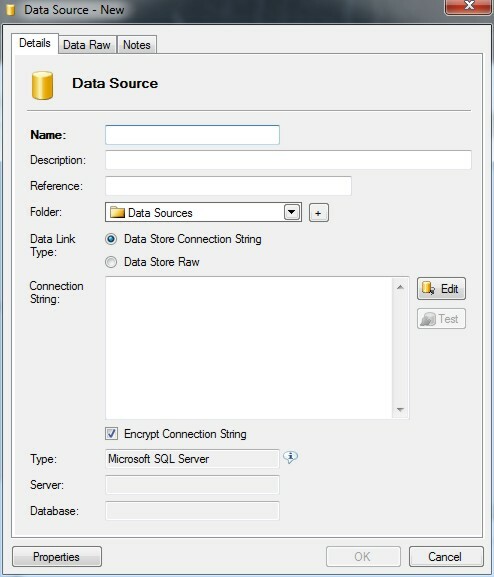 Specify the Data Source Connection parameters by selecting the Data Source Type and Connection String from the Connection Dialog. 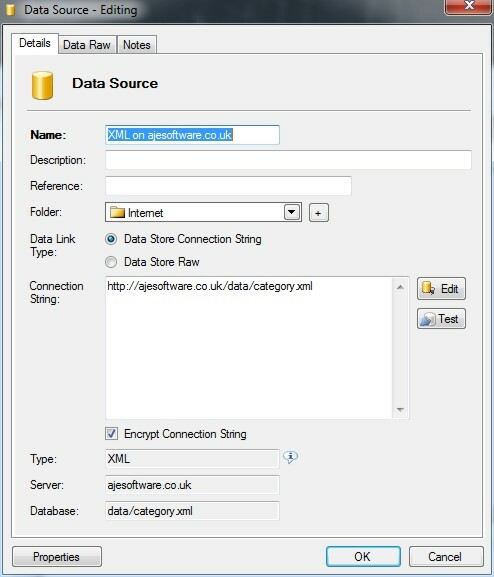 Data Source Files can be XML, CSV or TXT. These Data files can be local, files on a network or files located on the Internet / Intranet. 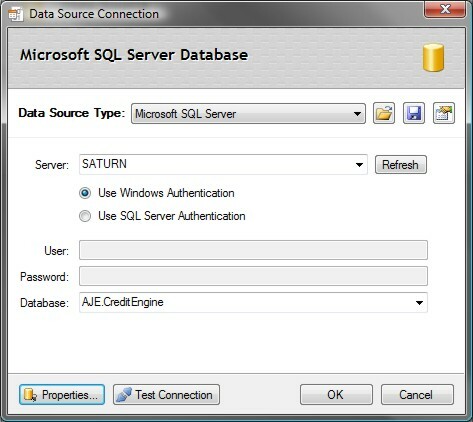 The URI properties of the Data Source allow the parameters to be defined for Host, User Name and Password if required. Encrypted Data files can also be downloaded using HTTPS therefore securing Data transmission. Enter the Host, Port and Path for the Data and the Security Credentials. If the Data is Encrypted with AES 256 Encryption then set the Encrypted Property to True. The Advanced Encryption System (AES) uses a 256-bit encryption key. The secure Key must be setup in the Program Settings and Options. 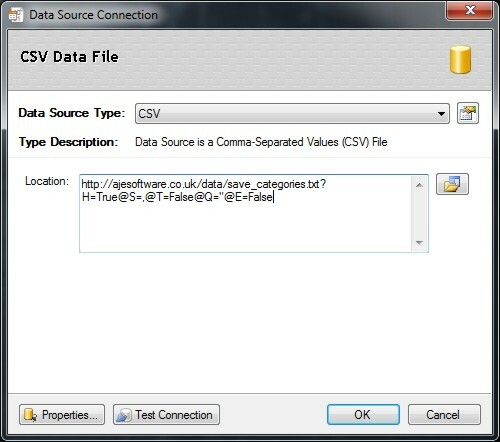 The name "CSV" indicates the use of the comma to separate data fields. Nevertheless, the term "CSV" is widely used to refer a large family of formats, which differ in many ways. Some implementations allow or require single or double quotation marks around some or all fields; and some reserve the very first record as a header containing a list of field names. Connection String for the CSV Data Source File. 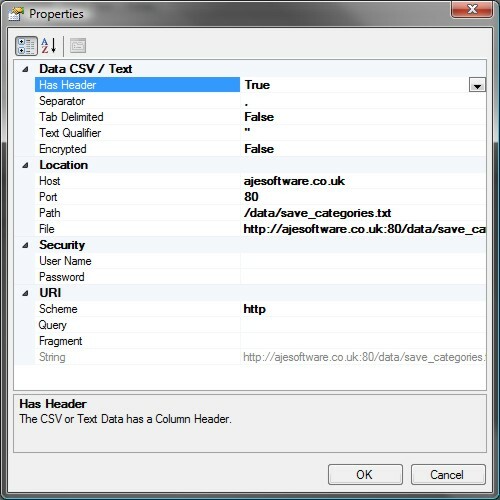 CSV Data can use different characters as the separator and text qualifiers. These characters can be changed when setting up the Data Source to read CSV Data. Additionally some CSV may or may not have the first line of text as the column header which represents the name of the field in the Data Table. All these options can be setup for the CSV Data Source thus ensuring complete compatibility with all CSV and Text Data Sources. Pulling Data down from the Internet is a useful and powerful feature of Indigo DQM. 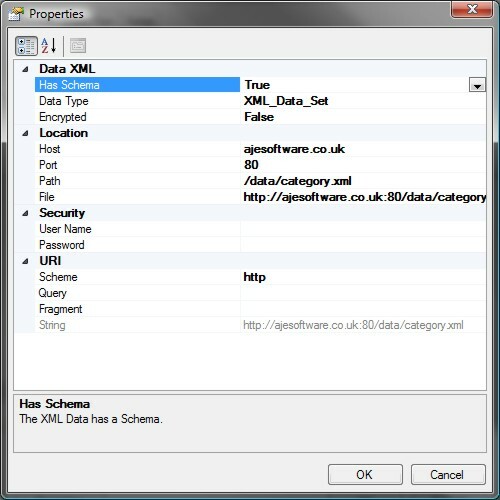 Specify the Location to the XML Data and the Data Source Connection Properties. 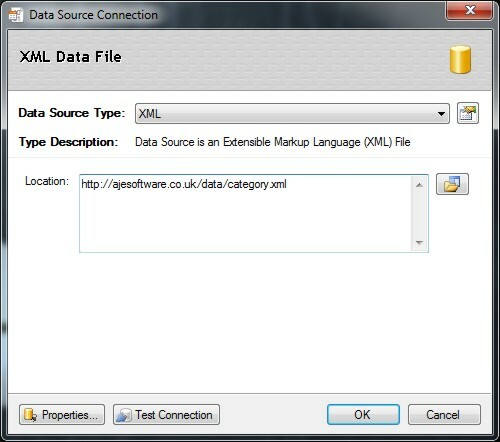 The Connection Properties of the XML Data File. Enter the Host, Port and Path for the Data and the Security Credentials. If the Data is Encrypted with AES 256 Encryption then set the Encrypted Property to True.